* This is my column in BusinessWorld last week. The bigger the socioeconomic unit like a state, the less central planning should be. And the smaller the socioeconomic unit like a household, the bigger the planning should be. The family is a good example of this. Parents take care of their children until they grow up. Once the kids feel they are independent enough, they move out of the house. And moving out is an expression or an attempt at independence of the kids from the nitty-gritty of support and intervention by the parents or guardians. In contrast, in many countries including the Philippines, as the population expands and as the needs and aspirations of the growing population further diversifies, the state bureaucratizes further and regulates and imposes more taxes. 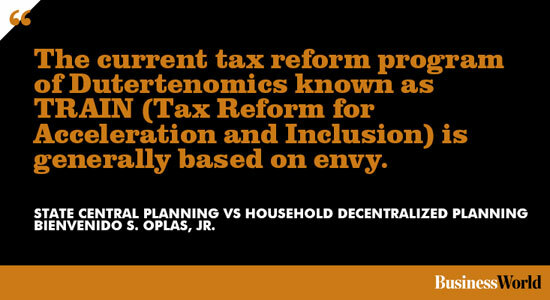 Meaningful decentralization and federalism is muted by high taxes and regulations from the central or federal government so that the states, provinces, and cities are left with little leeway for tax adjustments and regulations. The current tax reform program of Dutertenomics known as TRAIN (Tax Reform for Acceleration and Inclusion) is generally based on envy. While its income tax cut for the low income earners is good and commendable, its tax hike for upper middle class and the rich is not. And the government will hike the taxes of many other products and services including those consumed by the poor and lower middle class -- cars, petroleum products, sugar-sweetened beverages, more services that will be covered by VAT. This government therefore, its politicians and bureaucracies, feel that they have more entitlement to the income and wealth of the upper middle class and the rich. The implicit message is that if people aspire to become upper middle class and rich, the state will go after them, demonize them if they resist paying more taxes. And this is where the advice of Friedrich Hayek above becomes appropriate. During the BusinessWorld Economic Forum last May 19, 2017 at Shangri-La at the Fort, one of the impressive speakers in the afternoon session was Ms. Vicky Abad of Kantar. She discussed what are the income ranges of upper and lower middle class households and their aspirations. Below is the income class differentiation she made. ONCR means Outside of the National Capital Region (NCR) or Metro Manila (See table). Three things are worthy of note in Ms. Abad’s presentation. One, middle class households in C1, C2, and D classes comprise some 72% of the population or nearly three out of four households. Those in D should include previously bicycles- or jeep-riding people who now drive motorcycles or second, third-hand cars. 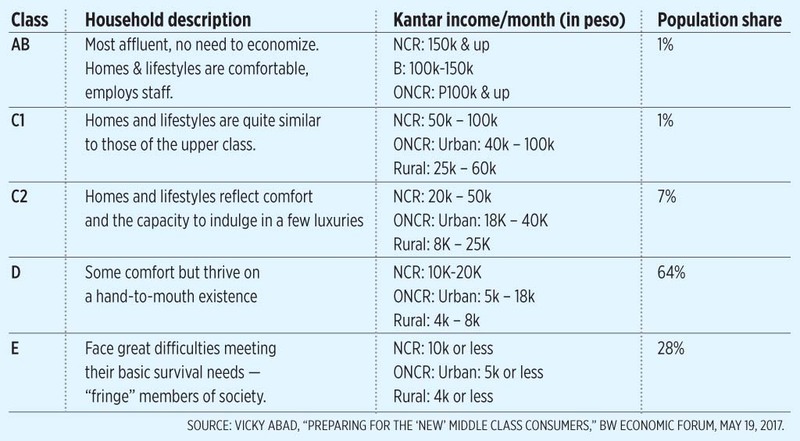 Two, while middle income class C1 and C2 are big consumers of fast-moving consumer goods (FMCG) or consumer packaged goods, the class D households drive about 62% of the FMCG market in value contribution. Three, the key, constant driver of middle class aspirations is being able to provide for the needs of family. Family basic needs, health, and savings are the top three concerns. Followed by friends/bayanihan, car and house, value of work, and social status/rewards like travel. Many of these things are not sufficiently provided by the government. There is public education, yes, but many middle class including government officials and personnel bring their kids to private schools and universities. There is public health but these people go to private hospitals and clinics when they are unwell. There is public peace and order by the police but these people employ lots of private security agencies to secure their villages, schools, shops, banks, buildings. There is public welfare department but many people still dig deep into their pockets and savings to help their fellow Filipinos struck by severe natural calamities. With this wide gap between government taxation and low quality of public services, and the rising aspirations of the people, government central planning should decline, and households should be given more leeway, more take home pay via deep income tax cut across the board. Household planning should prevail over state central planning.